Linear Friction Welding (LFW) has been established since the 1980ies as a niche welding process, where the work pieces are pressed against each other and moved forward and backward by ± 3 mm with a reciprocating motion of approximately 50 Hz. The process is mainly used by the aerospace industry, for instance to make the titanium blisks (bladed discs) of the Eurofighter. Das Verfahren wird vor allem in der Luft- und Raumfahrtindustrie eingesetzt. 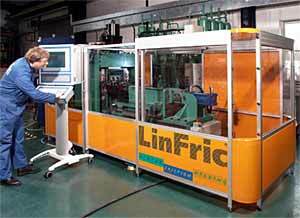 We have developed a hydraulic linear friction welding machine within the European LinFric®-Project (www.linfric.com). Even steel can be welded with this machine, for instance to make wheel rims of off-road vehicles. The main applications are, however, in the production of stationary turbines and Jet engines als well as the manufacture of near-net-shape parts by the aerospace industry. The concept has been developed and proven in a collaborative project with eight European partners. The experiences and contributions of the individual partners were exploited very effectively. The benefits of the hydraulic LinFric® machines are based o the innovative way to generate the oszillating motion in comparison to mechanically driven machines, which use a complicated gear box. Their heart is a hydraulic oscillator, which vibrates at a frequency of 25-125 Hz, an amplitude of up to 3 mm at an oil flow of up to 950 l/min. The maximum forging forces is 200 kN (20 t) so that cross sections of upe to 2000 mm² can be welded in steel. The hydraulic oscillator can provide both sinusoidal and non-sinusoidal motions, which is useful for some of the materials to be welded. Friction Welding of Aero Engine Components. 10th World Conference on Titanium Ti-2003, Hamburg, Germany, 13-18 July 2003.